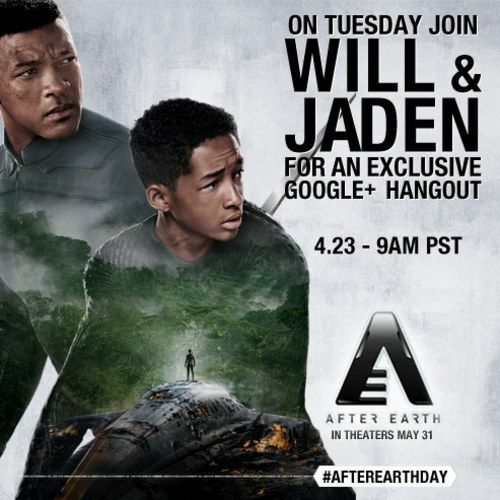 In advance of the nationwide release of After Earth, the highly anticipated film in theaters May 31, Columbia Pictures is teaming up with Google for a live "After Earth Day" Google+ Hangout tomorrow, April 23 - the day after Earth Day. The Google+ Hangout brings together some of the world's most renowned thinkers, inventors, authors, and futurists to discuss the film's themes and the future of our planet. The After Earth Day Google+ Hangout will be moderated by futurist Raymond Kurzweil, Google's director of engineering. Joining Kurzweil will be Elon Musk, the founder of SpaceX and the co-founder of Tesla Motors and PayPal; the environmental advocate, explorer and filmmaker Alexandra Cousteau, granddaughter of Jacques-Yves Cousteau; NASA astronaut Sunita Williams, an Indian American astronaut and a United States Navy officer who holds the record for longest space flight by a woman; and Jaden Smith and Will Smith, the stars of After Earth. On the literal day after Earth Day, they will discuss the future that awaits the human race on Planet Earth, in the context of the overall themes of the action-adventure. After Earth will inspire a conversation focusing on the important questions we face about the present state of the planet, the future, and the environment. The participants will also explore the interaction of technology development, space travel, and ecological preservation. The Google+ Hangout will take place tomorrow, April 23, at 12 noon Eastern / 9 a.m. Pacific. Moviegoers can tune in to the live Google+ Hangout at YouTube.com/AfterEarth, as well as Google.com/+AfterEarth where fans are invited to submit their questions for a chance to have them answered by the panelists. For additional updates, go to Facebook.com/AfterEarth and join in on the conversation online using #AfterEarth. In After Earth, a crash landing leaves teenager Kitai Raige (Jaden Smith) and his legendary father Cypher (Will Smith) stranded on Earth 1,000 years after cataclysmic events forced humanity's escape. With Cypher critically injured, Kitai must embark on a perilous journey to signal for help, facing uncharted terrain, evolved animal species that now rule the planet, and an unstoppable alien creature that escaped during the crash. Father and son must learn to work together and trust one another if they want any chance of returning home.